Our adaptation of Robert E. Howard's original story, "The Horror From the Mound", is one of the featured stories. 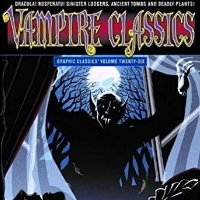 Vampire Classics features a unique adaptation of the 1922 silent film, Nosferatu. Plus a horror-western by "Conan" creator Robert E. Howard and Ray Bradbury's "The Man Upstairs." With "The Strange Orchid" by H.G. Wells, "Olalla" by Robert Louis Stevenson, and a short story by famed horror writer and co-editor Mort Castle.